Shown with white frame and blue upholstery. 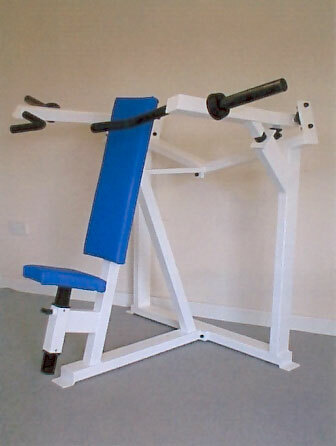 GymRatZ Commercial Gym Equipment - Iso Shoulder Press Station. Heavy, heavy duty Iso Shoulder Press Station. The GymRatZ Iso Shoulder Press Station features an adjustable seat and comfortable movement for lifting really heavy poundages. The upholstery's thick and durable and framework's constructed from heavy gauge steel. Dimensions (mm): 1200 L; 950 W; 1100 H.